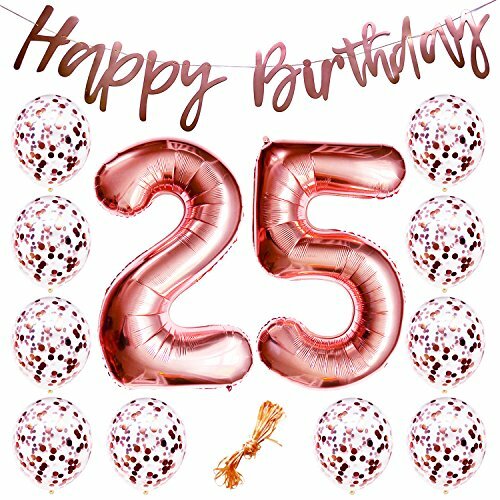 The YouParty Rose Gold Birthday 25th Huge Number Bundle is undoubtedly the cutest way to celebrate the superstar in your life! And with the pre-strung banner, you can celebrate how easy and fast it is to hang too! All balloons suitable for inflation by air, helium or mouth. Love it or we'll refund every cent - no questions asked. This bundle is the most quality matched with value, set you've found on your search. So go ahead and use the balloons for wedding, prom or rose gold bridal shower decorations, and gift the banner away. ... But Let's Address The Elephant In the Room - Quality. The biggest frustration about birthday party decorations online is that they often show up with missing letters and numbers, damaged or unable to float. If you're anything like us, you love the satisfaction of a party that goes off without a hitch. So we use only thick premium-grade latex and mylar, delivered with care. And while we can't say you won't find that one in a million balloon that had a bad day, we can promise there will be no missing letters.No YAPPY BIRT's here! And of course, we will always send a replacement ASAP, or refund your purchase. We don't like a spoiled party either, so check your delivery the moment it arrives. Love your 25th Birthday Bundle knowing that you and your rose gold backdrop will be the star of the show! Order now. ✅ROSE GOLD BIRTHDAY FOR A STAR: It's Her 25th Birthday, Make it Elegant and Unique with Rose Gold. You can hang this 13 piece Rose Gold Decorations Set [The YouParty Rose Gold 25th Birthday Bundle] knowing that your birthday girl is going to love it! ✅PREMIUM GRADE DECORATIONS: Unlike some different quality party suppliers, we won't forget to pack birthday letters in your order, because your Happy Birthday banner comes prestrung! Your Birthday Bundle includes Twelve  thick Premium Grade balloons: 10 pre-filled Confetti, 1 Huge Foil "2", 1 Huge Foil "5"and 12 x 1.5m pieces of Gold Ribbon for attaching. All Balloons accept air and helium. ✅EASY TO HANG: Your extra large Happy Birthday banner is 3m long, and very easy to hang. The rose gold and confetti balloons are 12", and the 2 numbered balloons are 40" and also easy to use. Now, some people call them blush balloons, peach balloons, and mistakenly champagne balloons! But make no mistake, these are definitely NOT pink balloons! In fact, this is rich rose gold we've all come to love. ✅THE YOUPARTY GUARANTEE: Expect your banner to arrive as we promised, pre-strung undamaged, and without missing letters. And expect your balloons to be free from holes. Love your Rose Gold Birthday Star Bundle (...take lots of pics) or we'll refund every cent. No questions asked! So why not order now. ✅SHIPS FROM THE USA: Receive your decorations with lightening speed! If you have any questions about this product by YouParty, contact us by completing and submitting the form below. If you are looking for a specif part number, please include it with your message.